I lived all my life in a small city in Brazil, and I also studied in a university that is considered small in comparison to the others that are reference there. 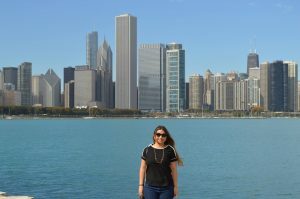 Having the opportunity to live in Chicago and study at Illinois Tech, was doubtless a great experience in my life, I could go out of my comfort zone in all the imaginable and possible aspects. As soon as I stepped out the airplane, the challenges began. I thought my English would be good enough for me to communicate clearly, but I faced some difficulties. It was not that easy to understand people, also not that easy to make them understand me. I was definitely not used to be in a big city, everything was so huge, scary and wonderful at the same time! But fortunately I was lucky, because I had all the support from Illinois Tech in all the way to arrive to my new home and also in making the necessary procedures for my installation. In the first days, discover Chicago became an amazing experience. Not only in the first days, actually. Until today, the city can surprise me with so much beauty, there are lots of places to go, many things to do and of course always with a pleasant view. In my free times, I liked just to wander around the city, know new neighborhoods, visit the parks and see the buildings. My favorite spot is the planetarium, where I can have an astonishing view of the skyline. At Illinois Tech, I also faced some difficulties at the beginning, again because language issues, and I also could notice many differences on the way of teaching here in comparison of what I was used to before. The professors worry more about their students, and they were always available to help, which it was very good for me on my adaptation process. Also, the fact of living on campus made lot easier to be involved in a learning atmosphere. The library was right next to my door and I also lived near to the buildings where I used to have class. At total, I lived almost 10 months in Chicago, and in 9 of them I was an Illinois Tech student. At the end of this time, I did not have any language issues anymore, my English improved a lot, I participated in some projects and could learn in great labs with very well capable professors, I had contact with other cultures by having contact with people from another countries, and I also made amazing friends that I am sure I will take them for life. I could not have enjoyed more my time there.